Homeowners who are refused mortgage modifications are sometimes given a reason that is false. Some loan servicers say that mortgage investors won’t allow the modification, but that is seldom the case. Consider the case of the Baileys. Litton, a subsidiary of Goldman Sachs, services their loan, and Litton’s contract with investors has no clear language banning modifications. In fact, documents show that over 115 other mortgages from the same investment pool have already been modified. Investor-owned mortgages represent more than a third of trial and permanent modifications in the government’s program. Under the program, servicers must modify the loans of qualified borrowers unless contracts with investors prohibit the modification, or if calculations determine that the investors won’t benefit from a modification. Investors’ contracts rarely prohibit modifications, and at times, ProPublica found, they have been blamed for denials even though other mortgages owned by the same investors have been modified. Even when contracts with investors do have restrictions, servicers don’t appear to be following federal requirements that they ask investors for waivers to allow modifications. Treasury’s Maggiano says the government is investigating investor denials and considering greater consequences for servicers that wrongfully deny modifications. Servicers’ compliance and accountability have been a major problem for the government’s program. Treasury has threatened penalties before, but it hasn’t yet issued any. And the contracts that servicers often blame are usually not a roadblock. A report by John Hunt, a law professor at the University of California, Davis, looked at contracts (PDF) that covered three-quarters of the subprime loans securitized in 2006 and found that only 8 percent prohibited modifications outright. Almost two-thirds of the contracts explicitly gave servicers the authority to make modifications, particularly for homeowners who had defaulted or would likely default soon. The rest of the contracts did not address modifications. Tracking down the servicer’s contract with investors, or even just the name of the mortgage-backed security that owns a loan, is often a struggle. Many homeowners and advocates report that servicers will not tell them the name of the security. But in 1995, as part of efforts to increase consumer protections in the mortgage industry, Congress passed a law amending the Truth in Lending Act (section F) to require servicers to provide the name and contact information for the owner of a loan when a homeowner submits a written request. The Federal Reserve, which has authority over the Truth in Lending Act, confirmed the law’s requirement that the information be provided. PNC declined to comment and referred us to the Mortgage Bankers Association, an industry group, which asserted that onerous requests from homeowners don’t require responses. It did not specify what it considered to be onerous. These difficulties extend into court as well. Karen Gargamelli, an attorney with the nonprofit legal-services group Common Law in New York, says Bank of America took eight months to provide the contract that covered one client’s loan, despite being in state-mandated foreclosure settlement conferences. The bank produced the agreement only after a court order. After a year and a half in settlement conferences, the court-appointed negotiator recently found that the bank was not negotiating in “good faith” and recommended that a trial judge cancel the foreclosure. Treasury has recently begun requiring servicers to provide a list of every potential restriction for every agreement that could impede a government modification. Though the department has not yet decided if it will make the list public, the government’s compliance teams will at a minimum have the list to check denials that homeowners or housing counselors bring to their attention. Sitting in his home in La Place, La., 20 miles north of New Orleans, Arthur Bailey says he is usually an optimist. At 68 years old, Bailey, a retired mechanic, thinks he’ll live “another 99” and hopes to live independently with his wife, Alberta, in their own home. 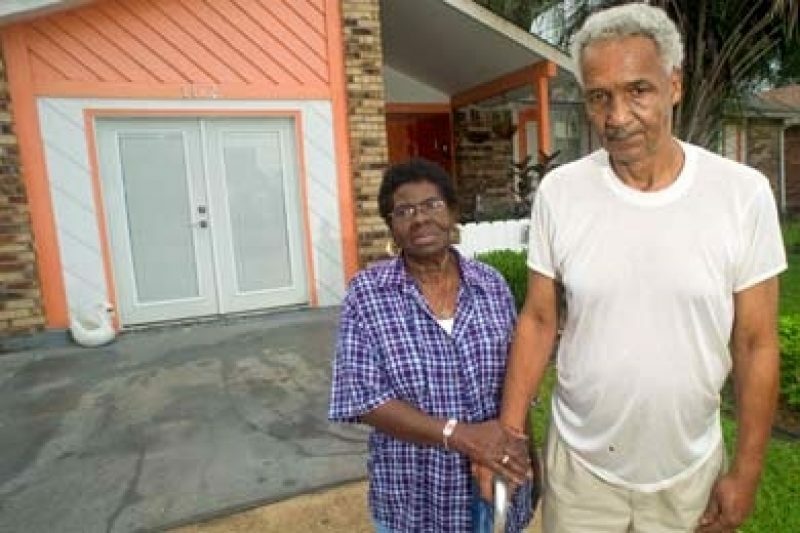 But after Hurricane Katrina, a series of problems, including complications from a change in mortgage servicers, left the Baileys behind on their loan. The new servicer, Litton, told them they had to pay up. Now they’re on the brink of foreclosure. Photo by Matthew Hinton for ProPublica. For two years, even before the government program began, the Baileys have been trying to get a modification. They say they can afford their original loan payment of around $500 but can’t pay the extra $238 a month that Litton demands to cover the late payments, accrued interest, and fees. Their only income is less than $1,600 a month from Social Security, and both are limited by health problems: Arthur had a stroke several years ago, and Alberta had a kidney transplant in February. 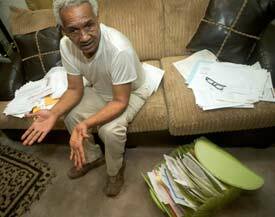 “I’m a cripple putting off buying a $99 wheelchair,” Arthur Bailey said in his Louisiana drawl. But data that the security’s trustee reported to investors shows that more than 115 mortgages in Bailey’s pool have been modified. The Baileys have reached an impasse. Litton canceled a foreclosure sale in March when Alberta Bailey had major heart surgery after complications from the kidney transplant. Arthur Bailey says he is “just living in limbo.” Litton could put the house up for sale any day. Reporter Paul Kiel contributed to this story.